Capricorn will be taking the stage at Bridge Street Live on Saturday, April 27, 2019 at 8:00 PM! Capricorn performs the music of the Allman Brothers Band. They bring the excitement and precision of 2 drummers, 2 guitars, bass, keys and vocals that come ever so close to the original classics of these Southern Rock and Blues pioneers! Classic songs like Whipping Post, One Way Out, Melissa, In Memory of Elizabeth Reed, Midnight Rider, Statesboro Blues are well represented here, as well deeper tracks like Hot 'Lanta and My Only True Friend! 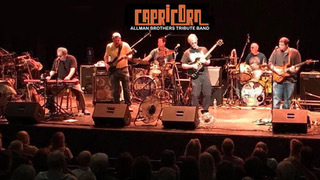 Tickets to see Capricorn - The Allman Brothers Tribute Band are $20 for General Admission and $25 for VIP reserved tickets (plus fees).